A short distance from the LaSalle Canal Boat is the Lock 16 Center’s Café & Gift Shop. 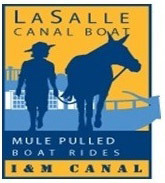 The restored vintage building was once home to a horse buggy maker and is now a hub for LaSalle Canal Boat rides and activities, visitor information, I&M Canal exhibits, lectures, afternoon teas and cultural programs. The Lock 16 Center is also a place to linger and learn, dine and shop, or have your next special event. Remember, all proceeds generated from café, gift shop and ticket sales are used to support the operations, mission and preservation of the I&M National Heritage Corridor. The Lock 16 Visitor Center, Cafe & Gift Shop are open year-round, 8:00am – 5:30pm daily.